Shriekers are one of the largest predators in the Valley. They are typically found where forests meet open space, and typically prey on herd animals of various sorts. They are pack hunters whose main strategy involves sneakily encircling the herd they’re hunting. Shriekers at the rear let out a horrifically loud, piercing scream that either a) roots you in place in absolute terror, whereupon they grab you, or b) sends you fleeing in panic, directly towards the rest of the pack, who then grab you. All the shriekers close in around the prey to prevent escape. The shriekers at the rear can take care of any stragglers. When their preferred prey migrates away during the winter months, shriekers go into hibernation. Like most hibernating animals, they will wake up periodically during the cycle, whether to engage in routine maintenance or because they’ve been disturbed by interlopers. Shriekers are keystone predators, making them essential for environmental balance in the Valley. Get rid of shriekers, and all of a sudden the herd animal population explodes, eats a bunch of plants that were keeping other plants in check, and the unchecked plants completely take over and kill off that one rare medicinal flower. Since the Valley’s economy is so heavily dependent on materials gleaned from unique microclimates, the people want to avoid making any drastic changes to the ecosystem. As such, despite their fearsome nature, it is illegal to kill shriekers except in self-defense. “Why not just use repellents to avoid the shriekers?” you ask. Unfortunately, repellents don’t work especially well on shriekers. Since so much of their hunting strategy involves running prey into traps, individual shriekers may be too far out of range to ward off with a repellent. Because they move so quickly, they’ve already bitten you in half before they notice the unpleasant smell. The best strategy is simply to move (quietly) during their hibernation season, or to monitor a pack and wait until they’re distracted by a hunt to sneak by. If they decide to go after you, find some low, dense shrubbery to hide in, and then stay as still and as quiet as possible. 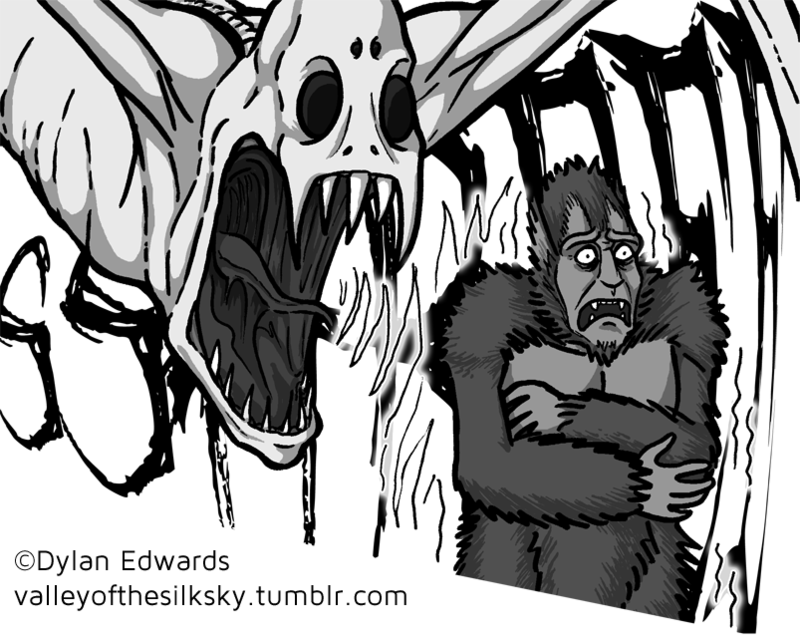 You may have to sit there awhile, but eventually the shriekers will lose track of you and wander off. 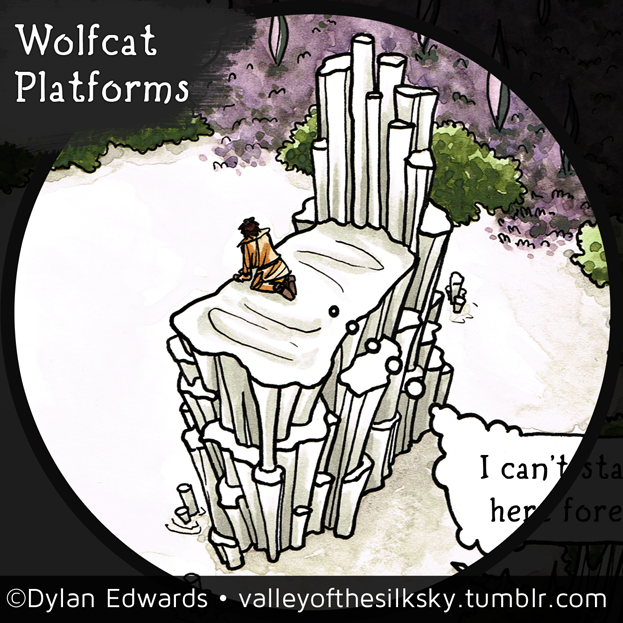 A wolfcat platform is a platform you climb to get away from wolfcats. How about that. While the pillar structure itself is naturally-occurring, it has been augmented to accommodate an about-to-be-eaten person. You will typically find wolfcat platforms clustered near waystations. The platform itself is about 20 feet up and is accessible only by climbing some steep pillars with narrow footholds. The pillars angle out slightly, making it extremely difficult for a four-legged, dog-footed creature to amble up. The large, flat area allows you to lay low enough to get out of the line of sight of the wolfcat. Once you’re out of sight you wait it out until the wolfcat loses interest and moves on.